So this was my first time etching glass. I was a bit nervous, but I found that I absolutely LOVED it and I thought you guys might too. See what you can make? Doesn't take much and it's not only inexpensive, but LOOKS fantastic. Cutting tool such as a Silhouette or a utility knife and your time and patience. Design and cut your stencil, leaving at least a 1" edge around your design that you want to etch. I knew that I wanted to do snowflakes on mine so I measured the candleholder and eyeballed about how big I wanted it. Pulled up the image in Silhouette Studio, sized it, and cut it out on my vinyl. Once your design is cut, use your weeding hook to pull out the part that you want to etch. Make sure that you get everything you want to see etched on your glass is weeded off of your stencil. Starting to weed out the design. Lay your transfer tape over the top of your design and squeegee across your stencil to get the vinyl to stick to your tape. Then transfer the design over to the glass. Go SLOWLY. 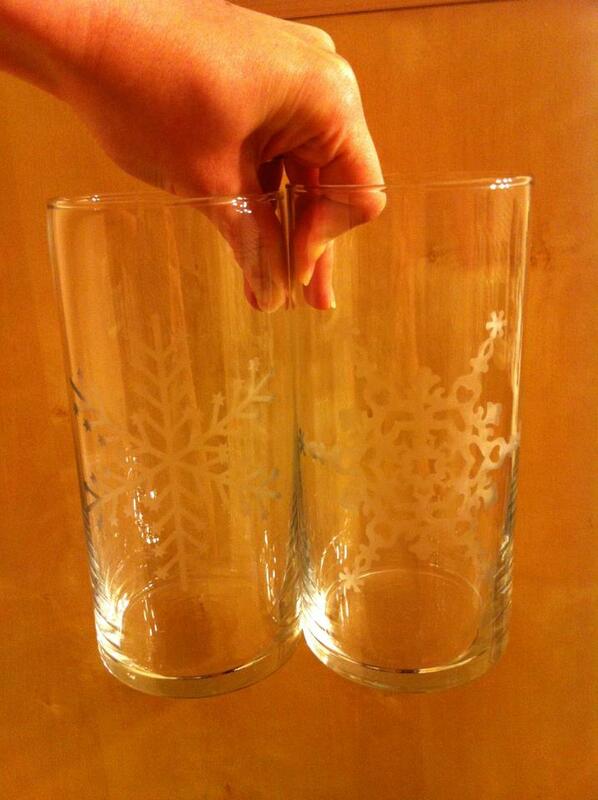 Make sure you line up your stencil before placing it on your glass. Then, squeegee it down REALLY WELL. You don't want any bubbles or lumps on the design part of your stencil. (Around the edge doesn't matter, but you want to make sure that the design part is squashed on there nice and tight so the etching cream doesn't leak out through a non-secure part and blur or smear your design.) I squeegee'd and then went back over with my fingers. Using your old paintbrush (**DON'T TOUCH THE CREAM WITH YOUR BARE SKIN**), blob the etching cream on there. Be GENEROUS, don't skimp on this part, but be careful where you put it, if you go outside of your stencil, your glass will have a mark. Wait. :) I waited 30 minutes wiped a part off (use a paper towel, don't wipe with your hand) and held it up. It wasn't as deep as I wanted it to be, so I reapplied to that spot and waited 30 more minutes... then went on to Step 7. If, after you rinse, you are still not happy with how deep the etching is, you can dry it off completely, and then redo Steps 5-7. If you're happy with how it looks, then you can move on to Step 8. Remove the stencil and take a bow.